Japanese Individualism: Japanese Agriculture, a photo by timtak on Flickr. 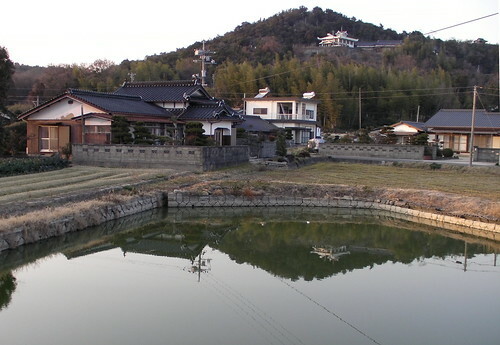 If you go into the Japanese countryside you will note that much of it is dotted with small lakes or ponds like the one in the foreground of this photograph. It is sometimes claimed that the irrigation required for wet field rice farming is the origin or cause of Japanese collectivism (Nisbett, 2003) since it is argued to require that farmers cooperate with each other in the construction of irrigation rivers and canals.Tamaki (1979) points out, however, that irrigation rivers and canals are only used in some parts of Japan (such as Saga Prefecture, whose habitants are indeed described as being collectivist by other Japanese) but in much of Japan farmers use private irrigation ponds enabling their farm to be independent of those around it. Furthermore, according to Bray's excellent book "The Rice Economies" (1994) UK farmers were required to practice crop rotation, planting wheat, leaving a year fallow, and then grazing cattle so that the cow dung fertilised their fields and made the planting of wheat the next season possible again. This mean that cattle and wheat farmers had to cooperate and since cattle are to large to be eaten by one family, families and farms had to cooperate with each other. The integration of two forms of farming to form the UK agricultural system encouraged higher degrees of cooperation, diversification and specialisation in the workforce (dairy specialists, harvesters, butchers, ploughmen), each becoming a cog in the overall agricultural system, which lead to economies of scale and eventually to the formation of the giant social industrial machine that was the industrial revolution. It was not that the British were great individualistic inventors that the industrial revolution started in that small island (the steam engine had been around for centuries) but rather because the British were more cooperative, and in that sense collectivist. The fertility of the Japanese climate, combined with the use of the fermentation process that takes place wet field rice paddies, means that no cattle dung is required. Household waste was sufficient fertilizer. Human protein requirements can be supplied by rice protein, when mixed with proteins from other grains. Rice farmers, with their own irrigation ponds at least, were not required to cooperate, nor specialise. They were the master craftsman of their own paddy field. Thus able to farm their fields on their own with only the help from their own family members, rice farmers remained blissfully, and ruggedly, independent for far longer. The Japanese do have an strong overt ethos of "lets get on well together," and "harmony" (Yamagishi, 2002) partly to balance their self-love and individualism, so even the Japanese think that they are collectivists. Since they are also Nacalian imago-centrists they attempt to explain their culture by reference to their environment, even the Japanese think that it is rice farming that has encouraged them to be so "harmonious." Since the Japanese are not into linguistic self expression (that strange bent of Westerners) their visual individualism, self-esteem,and visual creativity goes unnoticed. Bray, Francesca (1994) "The Rice Economies: Technology and Development in Asian Societies." University of California Press.